This week we spent developing our visual understanding of the level through concepts, room and lighting plans. A lot of our planning was actually 3d concepted, I think it’s because for the majority of our group, including myself, our primary strengths aren’t 2d and with a 4 week timeline, we were under a lot of pressure to work fast. It was because of this that most a lot of the very basic room modelling was done over because 3d paintovers were such a crutch for us and have been prevalent as the ‘most efficient way’ of planning a level. It was actually a method I criticized at first, before quickly jumping ship and embracing it. hat would frame the large final vault door that was located at the back of the reception. I wasn’t overly happy with the quality of the paintings, but I think the ideas were strong enough. 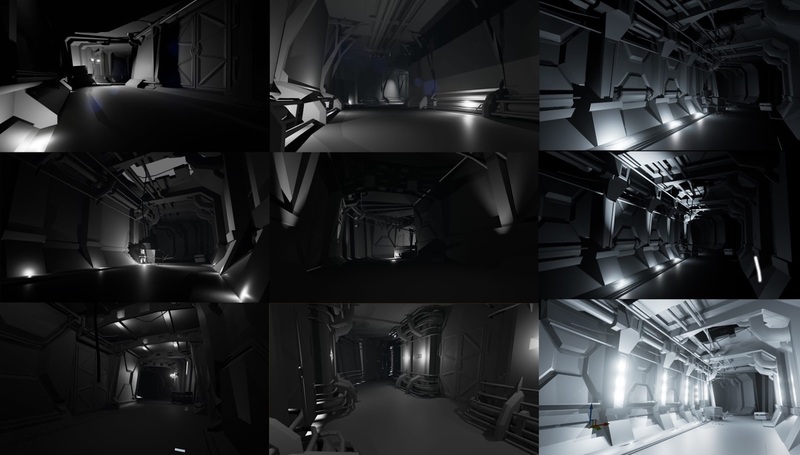 The far right column was my adaptation of Jake Roddis’ container hallway design, using a mix of already created assets and a new selection of my own, I modelled a hybrid of our ideas which is what we went for. I think I was particularly diligent (to the point overbearing) on hassling everyone about being conscious of light sources and how they could be built into the walls and what not. I like the low lit atmosphere that Jake had created and used them in my first two concepts, but was also keen to try and a largely contrasting bright hallway. We liked both which is perhaps what spawned our primary mechanic. Based on these we decided that instead of collecting a key from the bottom floor, you could go into a tech room and turn on the power, lighting the entirety of the building. This was an idea we were all really excited for, as it would be like walking back through an entirely different level and completely change the spooky tense atmosphere. It was a way to offer a different player experience within the same level which we were all totally on board for. 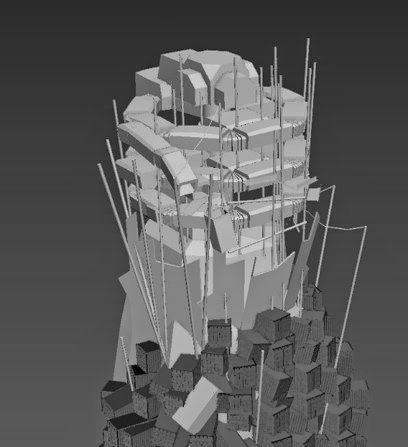 This week also had big ramifications on the layout plan, we decided the hallway connecting the two layers didn't really work, we also had some pretty detailed concepts and whitebox models of the exterior of the container, but the player never got to see it. We decided to implement a way to interact with the outside so we had it as one of the corridors falling down, dropping you onto the roof of the containers below where you re enter from a hatch. We were fully aware that we were adding a lot more work to our pile when we decided to do this, but it was such a good way to show off our structure from a different perspective- as well as break up some of the monotony of going around a dimly lit corridor in circles- that we decided it was worth it. 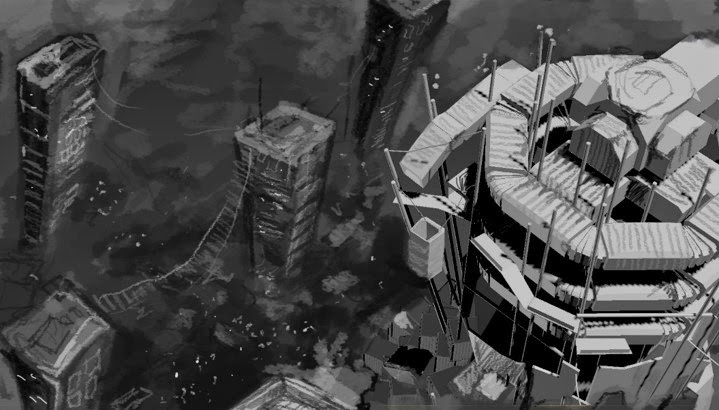 It was soon after this change that our main concept artist Annie Wyatt painted our structure from the outside and in context. This was hugely influential in selling our idea and because the touchstone and reference point for all environments. It gave our building a bigger feeling of scale, to help ease the burden of modelling and outside environment, the plan is to just use heavy fog with lights underneath to insinuate a city or town below it, with large producing (but simple) towers breaking through the mist.